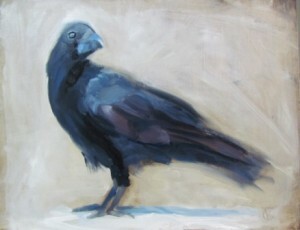 This is the third in this series of members of the Corvidae family . They are intelligent birds with definite presence. This guy is telling us something I’m certain. I was drawn to this pose because this character seems to be drawing on all the energy in its body to call out a message. No sweet little songs in the repertoire! 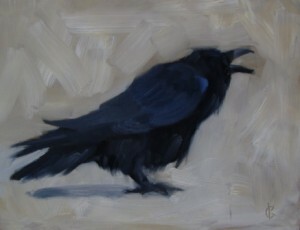 This is crow number two. I liked the graceful turn of the head and the quizzical look. It seems we are the ones being sized up! This post is the first one in the new version of my painting site. 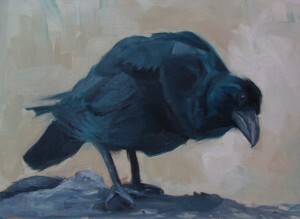 The title, Crow on Rocks, is 9×12 inches painted with oil paint on a prepared board. Thanks for your patience. I am finally set up with Daily Paintworks and will be adding smaller pieces for auction and fixed prices to that online gallery. Hope you’ll click the button to just have a look around that site. I’m pleased to see my work in the company of so many great images.